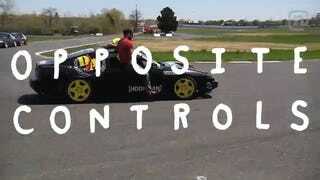 Welcome back to Ryan Tuerck's Opposite Controls Drifting. Here's how it works: the driver only does the steering and the passenger does everything else. Sounds simple, right? Well, it worked pretty well on its debut on Tuerck'd last season, but this time opposite controls drifting got more complicated. They decided to go tandem, adding in Vaughn Gittin Jr and Tony Angelo. Things got a little crash-ey. That said, Opposite Controls Drifting is still the best drifting game I've ever seen.